So cute and a lovely holiday inspiration. Haha...cute. For that somewhat naughty recipient. Too cute!! Thanks and Happy Holidays!!! I am going for Nice..and filling with candy...Love it! LOL! This is so cute!! What a super fun box. Thanks for the smile! OK this is adorable .... I am loving these SVG cuts!! Super cute idea! I just found these candies last week and now I have a great project to make with them! Adorable, cute, awesome. . . love your project. . . thank you for sharing. . . have a great crafty day. Simply adorable! I can see several uses for this project! Thank you! Ack! This is completely awesome! This is so stink'n cute!! 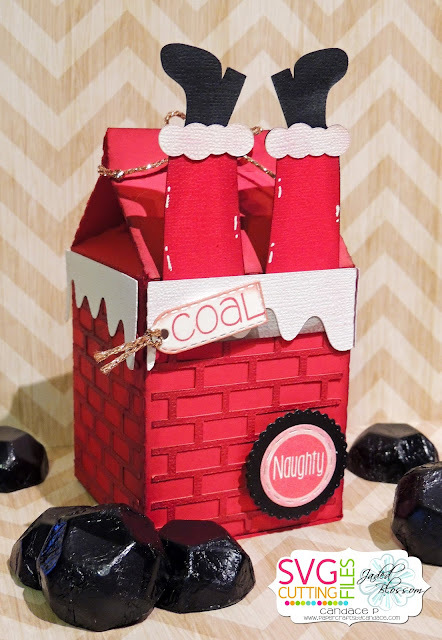 Very creative, love the coal. poor Santa stuck in the chimney! Too cute! What is the coal? Sweet treat box. Love the coal candy spread around. Great project. Haha!! How super cute is Santa being stucked? Oh, that Santa. Coal in my stocking. really love this milk carton idea!! No coal for me! But I can think of some people who deserve it, LOL. Oh what fun it is to tease those that deserve coal! SUPER CUTE project! He, he, he... really adorable! So cute! It actually makes getting coal cute! I love it! So cute.. Love the brick. Poor Santa he got stuck! Cute box. Super cute; love the details! I could see Charlie Brown getting this except that the box is just too darn cute! This is great, love it for the coal. Too cute! Love the idea of filling it with "coal." Very cute and perfect for the coal. I love this idea...thanks for sharing.. I really like the way it looks like real bricks! This is cool!! yikes, hope I don't get coal. but this is so cute. I love this!! Very different and fun! Everyone needs a little coal for Christmas. Really cute Santa gift box! gotta love cute and funny! which inspire me to keep pushing myself to improve. Such an adorable treat box! Love it! Thanks for all your hard work!